Hindustan Zinc was awarded at Indywood Built In India Excellence Awards 2018 under the Metals and Minerals category. The Indywood Built In India Excellence Awards were held on 4th December 2018 at Hyderabad to recognize and felicitate the efforts made by organisations to boost the concept of ‘Make in India’ and make the country proud in the international front. The award was presented by His Excellency from Saudi Arabia - Mohammed Ibrahim Al Qahthani. On behalf of Hindustan Zinc, BHRS Reddy, Associate Vice President – Central Design Cell received the award. Vice President and Head – Corporate Communication of Hindustan Zinc, Pavan Kaushik said, “We are very glad to receive the Indywood Built In India Excellence Award. Hindustan Zinc is India’s only and world’s leading integrated Zinc – Lead – Silver producer. The Company governs about 85% of growing Zinc market in India and produces almost 100% of India’s integrated Silver and is proud to be known as Zinc and Silver of India”. 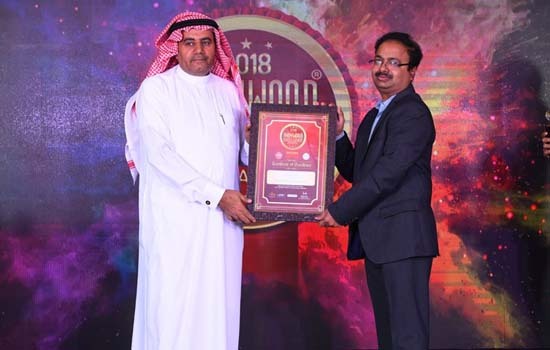 The Indywood Built In India Excellence Awards 2018 was organized by Indywood and Govt. of Telangana State as part of Project Indywood.